For the musical that played at Disney California Adventure, see Disney's Aladdin: A Musical Spectacular. In November 2010, Alan Menken confirmed that a musical theatre adaptation of the movie was in the works with a book written by Chad Beguelin. The musical premiered in Seattle, Washington, at the 5th Avenue Theatre from July 7 to 31, 2011. Jonathan Freeman, who voiced Jafar in the film, reprised the role onstage. Adam Jacobs and Courtney Reed played Aladdin and Jasmine. Additional cast included James Monroe Iglehart as Genie; Clifton Davis as the Sultan; Don Darryl Rivera as Iago; and Andrew Keenan-Bolger, Brian Gonzales and Brandon O'Neill as Omar, Kassim and Babkak, a trio of characters conceived for the film but ultimately replaced by Abu. The production was directed and choreographed by Casey Nicholaw. The set designer was Anna Louizos, with costumes designed by Gregg Barnes. The special effects were created by Jim Steinmeyer. Aladdin had a pre-Broadway tryout at the Ed Mirvish Theatre in Toronto, Ontario, from November 2013 to January 2014. Nicholaw, Barnes and Steinmeyer returned as director-choreographer, costume designer and special effects creator respectively, with Bob Crowley replacing Louizos as scenic designer. The musical premiered on Broadway on February 26, 2014, in previews and opened on March 20, 2014, at the New Amsterdam Theatre, taking the place of Mary Poppins. The show was nominated for five Tony Awards, winning one for Best Performance by a Featured Actor in a Musical for James Monroe Iglehart. The cast album was nominated for the Grammy Award for Best Musical Theater Album. Aladdin was produced in Hamburg, Germany, in 2015 in partnership with Stage Entertainment. A West End production was confirmed for 2016 at the Prince Edward Theatre in London, taking the place of the revival of Miss Saigon. In July 2015, Disney Theatrical Productions and Tim Rice announced that the production would open in summer 2016 and that auditions would be held from August through September 2015. In October 2015, it was announced that the show would officially open on June 9, 2016, with previews beginning May 27, and that the Genie would be played by Trevor Dion Nicholas in his London stage debut. The official opening was later delayed till June 15, 2016. In November 2015 full cast was announced. Dean John-Wilson and Jade Ewen would play Aladdin and Jasmine. They would be joined by Don Gallagher as Jafar, Peter Howe as Iago, Irvine Iqbal as the Sultan, Nathan Amzi as Babkak, Stephen Rahman-Hughes as Kassim and Rachid Sabitri as Omar. It is scheduled to close on 31 August 2019, to make way for a revival of Mary Poppins. Aladdin had its Australian premiere in Sydney at the Capitol Theatre on August 11, 2016, where it played until February 19, 2017. Australian native, Ainsley Melham, originated the role of Aladdin, alongside American actors, Arielle Jacobs, as Princess Jasmine, and Michael James Scott, as the Genie. Following performances in Sydney, Aladdin opened at Her Majesty's Theatre in Melbourne on 15 April 2017. The Sydney and Melbourne productions performed an autism-friendly adaptation of the show which had the "removal of strobe lighting and pyrotechnics, reduction of any jarring sounds and house lights being dimmed (instead of off)" to provide a more supportive environment for autistic patrons. In 2018, the Australian tour included stops at Brisbane and Perth. In 2019, the show then transferred to a New Zelanad production, playing Auckland before returning to Adelaide to conclude its tour. On 15 and 19 February 2019 respectively, Michael James Scott and Ainsley Melham transferred to the Broadway company of the show, where they were reunited with Arielle Jacobs who had joined the Broadway cast the year before. This landmark casting decision made the Broadway leads the same as the leads of the Original Australian Cast. Disney Theatrical launched a North American tour at Chicago's Palace Theatre, where it played from April 11 to July 2, 2017. A second Asian production of Aladdin will open at the Marina Bay Sands in Singapore from July 21 to August 11, 2019. A great parade storms through the streets of Agrabah, led by Genie, Babkak, Omar and Kassim. They announce the arrival of "Prince Ali of Ababwa" ("Prince Ali"). Once at the palace, Aladdin, disguised as Prince Ali, expresses to the Sultan his desire to marry Jasmine. Jasmine overhears the conversation and perceives Ali to be just another shallow prince. Jafar, who is suspicious of Ali, tells him the location of Jasmine's bedroom, not mentioning that it is against Agrabah law for the Princess to have a suitor in her quarters unsupervised. Aladdin courts Jasmine with a ride on his magic carpet provided to him by Genie ("A Whole New World"). Once they return, Jasmine recognizes Aladdin as the young man whom she met in the marketplace. Aladdin lies and says that he really is a prince, he just sometimes likes to dress as a commoner to escape the pressures of palace living, much like Jasmine did that day. Seeing he isn't shallow and self-absorbed like the others, Jasmine kisses Aladdin good night. After she leaves, Jafar has Aladdin arrested for entering the Princess' room unsupervised. Upon hearing the news, Babkak, Omar and Kassim storm the palace to rescue their friend ("High Adventure"). They are captured and thrown into the dungeon as well, but with a little help from Genie, Aladdin uses his second wish to free them ("Somebody's Got Your Back"). Although the film was Disney’s first to feature non-white human protagonists, Disney did not consider ethnicity in the casting process for the musical. This 'colourblind' policy sparked some controversy, with the American Arab Anti-Discrimination Committee receiving numerous complaints from actors of Middle Eastern descent. The executive director of a US minority rights organisation lamented that the production had 'missed an opportunity' to showcase Arab-American actors, who remain underrepresented on Broadway. The pre-Broadway production in Toronto received mixed reviews. The National Post review said "This Aladdin turns out to be the best ever stage version of a movie", praising its score, direction, choreography, staging, lighting, design, and altered characterisations. CHCH said "Artistically, this Aladdin is top grade. It will become a classic." The Globe and Mail reviewer gave the show 2.5 stars out of 4, however, saying that it was "strictly for the kiddies". The Toronto Star gave the musical the same rating, and said "You’re likely to hear the sound of deafening applause [during the] show-stopping staging of 'A Friend Like Me' and James Monroe Iglehart’s blessedly bravura performance as the Genie. It’s the kind of exhilarating moment we go to the theatre for. But ... nothing before or after it in Aladdin lives up to those six sublime minutes." ^ a b "Theatre review: Forget the Lion, this Aladdin is king of the stage | National Post". Arts.nationalpost.com. 2013-11-22. Archived from the original on 2013-11-23. Retrieved 2013-12-13. ^ "Disney's Aladdin Musical in Hamburg". Stage Entertainment. Retrieved 2016-05-09. ^ "『アラジン』2015年5月開幕決定！". Archived from the original on 2016-12-06. Retrieved 2016-05-09. ^ "Disney's Aladdin coming to West End summer 2016?". What's On Stage. 2015-06-25. Retrieved 2015-07-14. ^ "ALADDIN Will Officially Open Summer 2016 in London; Casting Calls Set". Broadway World. 2015-07-30. Retrieved 2015-07-30. ^ Porteous, Jacob (November 23, 2015). "Full Cast Announced For London Premiere Of Disney's Aladdin - Tickets On Sale from 8:00 AM". London Theatre Direct. Retrieved November 23, 2015. ^ "Disney's Aladdin Opens at the West End's Prince Edward Theatre Tonight". Broadway World. 2016-06-15. Retrieved 2016-06-16. ^ "Official! Dean John-Wilson and Jade Ewen to Star in London Premiere of ALADDIN; Tickets on Sale 11/23". broadwayworld.com. Retrieved 23 November 2015. ^ "Supercalifragilisticexpialidocious! MARY POPPINS to Return to the West End in 2019". broadwayworld.com. Retrieved 14 September 2018. ^ "Aladdin Australia on Twitter". Retrieved 2016-09-29. ^ "Aladdin Will Take a Magic Carpet Ride to Australia". Playbill. 2015-10-15. Retrieved 2015-10-15. ^ "Disney's Aladdin Announces National Tour". Playbill. 2016-01-26. Retrieved 2016-01-28. 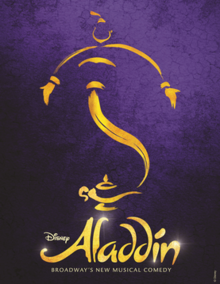 ^ "Aladdin Comes to the Sands Theatre in Singapore This July". Broadwayworld. 2019-04-10. Retrieved 2019-04-10. ^ J. Kelly Nestruck (2013-11-21). "There's a carpet, but not much magic in Aladdin". The Globe and Mail. Retrieved 2013-12-13. ^ "Aladdin's carpet ride is missing some magic: review | Toronto Star". Thestar.com. 2013-11-21. Retrieved 2013-12-13. ^ Baillie, Andrea (2013-11-22). "Review: Aladdin's magic may charm kids, but maybe not their parents (with video)". Vancouversun.com. Archived from the original on 2013-12-18. Retrieved 2013-12-13. ^ "BWW Reviews: Broadway Bound ALADDIN Opens in Toronto". Broadwayworld.com. Retrieved 2013-12-13. ^ Coulbourn, John. "Aladdin's wild magic carpet ride | Stage | Entertainment". Toronto Sun. Retrieved 2013-12-13. ^ Kennedy, Mark (2014-03-20). "Review: Disney hits magic again with 'Aladdin' on Broadway, thanks to a new Genie". Star Tribune. Archived from the original on 2014-03-22. Retrieved 2014-03-21. ^ Gardener, Elysa (2014-03-20). "It's genie-us! 'Aladdin' rubs you the right way". USA Today. Retrieved 2014-03-21. ^ Grier, Thom (2014-03-20). "Stage Review: Aladdin (2014)". Entertainment Weekly. Retrieved 2014-03-21. ^ Teachout, Terry (2014-03-20). "'Aladdin' Proves Its Worth on Broadway". Wall Street Journal. Retrieved 2014-03-21. ^ Isherwood, Charles (2014-03-20). "Sly Alchemy From That Lamp". New York Times. Retrieved 2014-03-21. ^ Stasio, Marilyn (2014-03-20). "Broadway Review: 'Disney Aladdin'". Variety. Retrieved 2014-03-21.